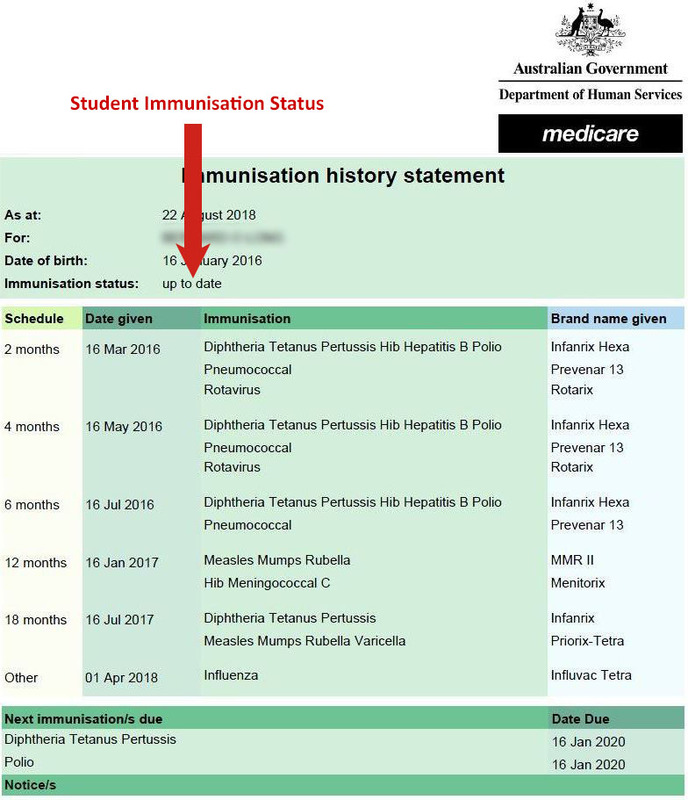 This article will show you how to upload immunisation documents and set immunisation status’ in Edumate Student Profiles. This is required for all enrolments as of April 2018 (as well as all junior enrolments since 2010), but should also be actioned for pre April 2018 enrolments where possible for duty of care. N.b. A student only needs to provide this document and have this process followed once at enrolment from Kindergarten onwards. Documents acquired during enrolment in Prep are invalid for non-prep enrolments and must be renewed upon entry into the junior school (or senior school if they are a returning enrolment at a later date). The only acceptable document is the offical AIR / IHS document shown in step 3. Any doctor / patient immunisation records that aren’t offical AIR documents aren’t valid proof of immunisations! Medical exemption certificates that are offical AIR documents should also be filed using this process. Conscientious Objection Forms should also be uploaded following this process, however the status chosen to accompany objection forms should be ‘No immunisation certificate provided’. 1. In Edumate, open a student’s profile then click on ‘Record Menu’ then ‘Medical Info’. 2. Click on the ‘Immunisations’ tab. 3. Click the drop down menu next to ‘Status (Childhood Vaccines)’. You will be presented with the following options, the option must match the status as per the status on the certificate itself. 4. Once the status is set, click on ‘upload’ next to ‘AIR Document’ (Australian Immunisation Register) and upload the document file. 5. Once the document uploads, you should see the name of the file you uploaded next to the AIR Document section as shown below. Don’t forget to click Save once the status is set and file successfully uploaded!